Formed in 2012, Classical Blast has continued their journey to explore and combine musical genre to create a new and exciting sound. With growing popularity throughout the Midwest region, the band has opened concerts for Joan Jett, ELO, Don Felder of The Eagles, Burton Cummings, Rik Emmet of Triumph, Stryper, and other national acts. 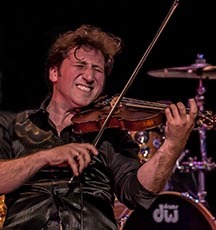 Violinist, Scott Daniel picked up his first violin when he was 4 years old. Originally from Oak Park, he is currently in the Masters Program at DePaul after graduating from Williams College in Massachusets. He has performed at music festivals in Vienna and Quebec, in addition to the U.S. He has also performed with a number of jazz and rock groups in Chicago. Greg Hirte is a violinist, actor and composer. He recently performed in Lookingglass Theater’s hit production of Hans Christian Anderson’s “Steadfast Tin Solder." Other theatre credits include: 19 seasons with Goodman Theatre’s "A Christmas Carol;” role of Luther in "Ring of Fire: The Music of Johnny Cash," and Leon in "Hank Williams: Lost Highway" (American Blues Theater). Greg has performed and composed music for Goodman Theatre, Chicago Shakespeare Theater, Court Theatre, Drury Lane Theatre, Victory Gardens Theater & Piven Theatre Workshop, as well as several international music festivals. He has also performed with bands, Mucca Pazza, The Flashbulb, Gin Palace Jesters, Can.Ky.Ree, and Mojo & The Bayou Gypsies. 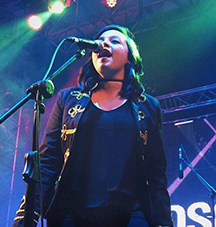 Sophie Monroy, our singer-guitarist, has been passionate about music since age 9 and has dedicated her life to her development as an artist. She has been part of choral groups as well as pop and rock bands in her home country of Guatemala. Her versatility as a singer has given her the opportunity to experiment with several musical genres including: jazz, blues, bossa nova, pop, rock, and alternative, among others. Thanks to her perseverance and dedication, she has participated in national and international music festivals in Central America, Mexico, United States, England and Germany, prior to joining Classical Blast in 2018. Originally from the Chicagoland area, drummer-vocalist David Kelly has been playing drums for 25 yrs. He studied jazz performance at the University of North Texas and California Institute of the Arts. 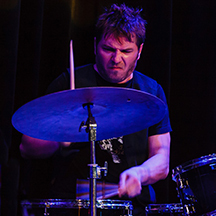 He played drums professionally in Los Angeles for 10 years. Dave toured for 5 yrs with The Drew Davis Band, a country band with a top 100 hit on the Billboard charts, opening for Hootie and the Blowfish on their final tour. The band also appeared on an episode of Gene Simmons Family Jewels in 2009. Dave also has a background in sound engineering. He currently lives in Chicago’s western suburbs. 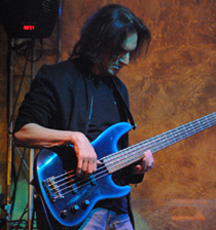 Longtime bass player Bill Syniar is a familiar figure on the Chicago music scene. In 1978 Bill co-founded the recording group Tantrum, producing 3 LP's on the Ovation label. Bill later toured throughout Europe and the states as bass player for CBS/Scotti Bros. recording artists Survivor. He appears on Survivor's "Too Hot to Sleep" and "Greatest Hits" LPs. Bill later founded the popular Chicago R&B band, R-Gang. He has written music for the Doobie Bros., as well as for Kansas vocalist Steve Walsh, members of the band Toto and countless other recording projects. He has performed live at major arenas across the U.S.
Cellist Kelsee Vandervall has been playing cello for 19 years. 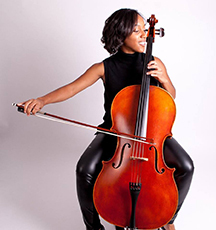 She graduated from Columbia College and received a dual Masters degree in Cello Performance & Chamber Music from University of Michigan. She was awarded a Fellowship to perform with the New Haven Symphony, touring with them all over the U.S. Kelsee has performed with Grammy award winner Paula Cole, Todd Rundgren, smooth jazz artist Brian Culbertson, gypsy jazz guitarist Samuel Strouk, Charlie Sexton, and with groups like the River Raisin Ragtime Revue and Glad Rags. She has recorded with singer/songwriter Yoshi Breen, on John Legend’s “Legendary Christmas” album and episodes of the FOX TV show “Empire." Kelsee spent part of 2018 touring with renowned hip-hop artist J Cole. She performs on both acoustic and 5-string electric cello.